Fall is in full swing here in the northeast! Autumn is a favorite time for many people, myself included. 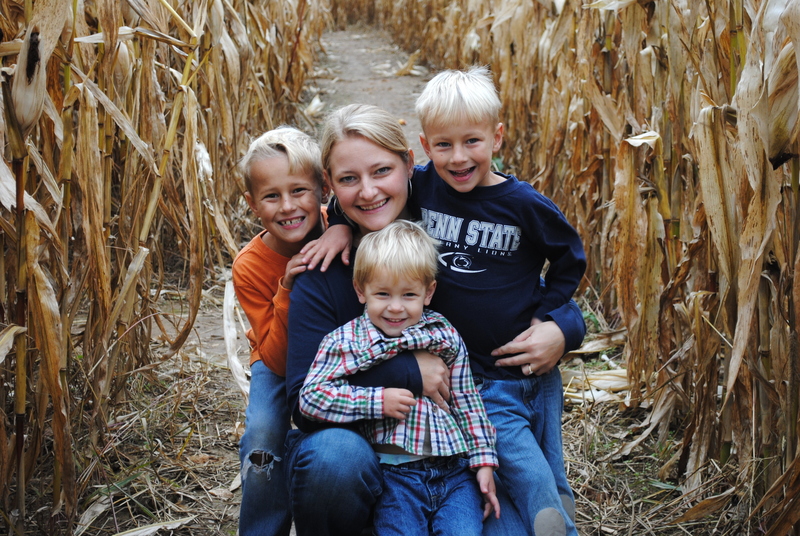 Oh I love this time of year….the smell of the crisp air tinged with wood smoke, baking sweet, spicy treats, crock pots bubbling with soup, and the fire crackling in my fireplace. I’ve mentioned before that I really enjoy all of the seasons, even the cold ones 🙂 I love cold weather food! 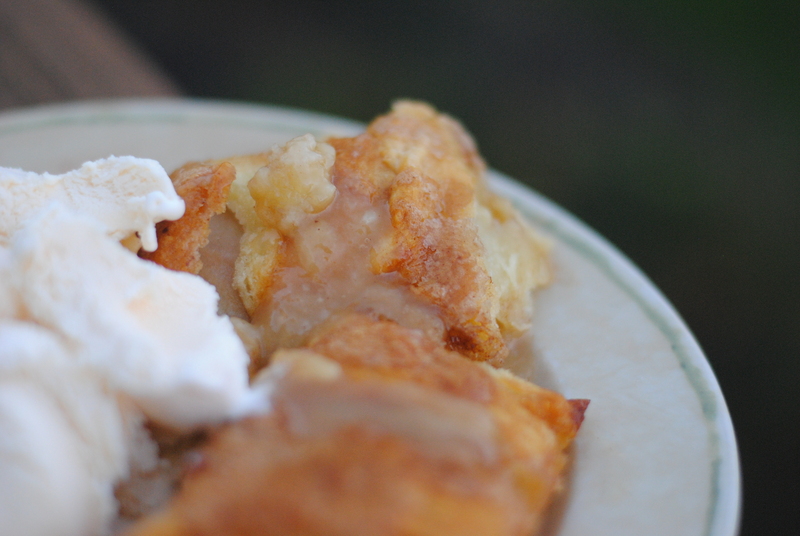 Apple dumplings are a much loved favorite. 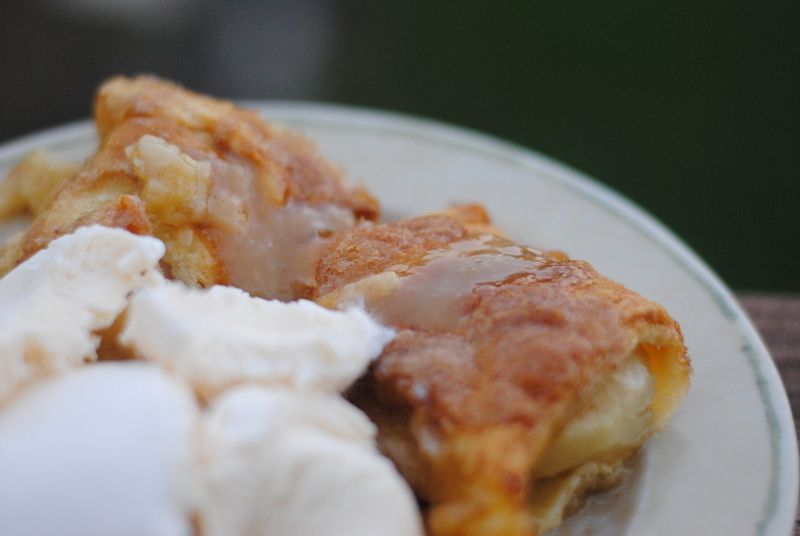 Light, flaky crust filled with soft, spiced apples…and hopefully topped with whipped cream or ice cream! However, I hate making the crust, I’m sure I’m not alone. 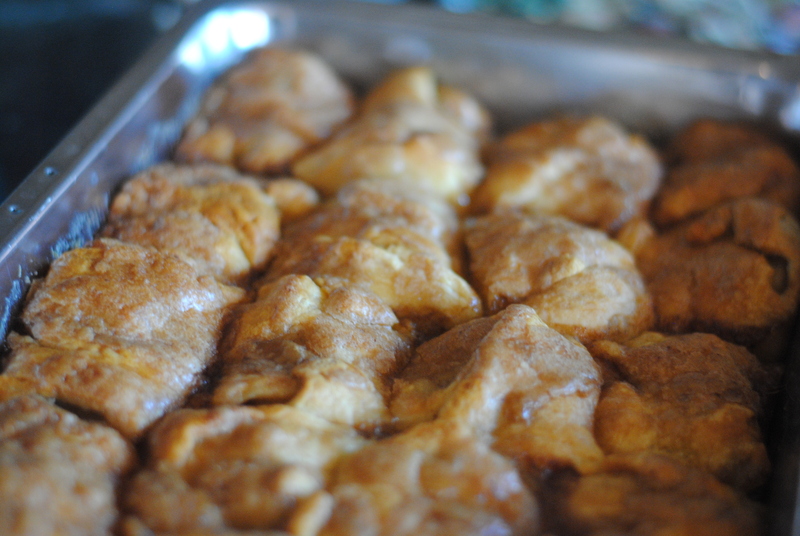 Finding the time to make the crust from scratch makes apple dumplings pretty labor intensive. That’s where this recipe is just perfect – the crust around the apples is store-bought crescent rolls. Some of you may gasp with horror, but sometimes you gotta do, what you gotta do! This isn’t exactly health food anyway, so in my mind, using crescent rolls is okay :). If that doesn’t convince you, this is a recipe adapted from the Pioneer Woman, and SHE is the queen of delicious, awesome recipes! These also have a can of soda in them – I know, weird! I’m not exactly sure what it does, but I think it helps caramelize the crust and make it, well….crusty. You could make these for a fancy dinner, an afternoon snack for the kids, or a cozy evening at home. This recipe is also easily adaptable – cut the apples smaller, use more dough, use less dough, whatever you like. They are easy enough that they can be whipped up whenever the craving begins! Peel and slice apples. You can make them whatever size you want, I cut my apples in quarters. Wrap each piece of apple in a crescent roll. Before rolling up the apple, sprinkle it with cinnamon and sugar. You can use the entire roll for a piece, or cut them down to fit as you desire. Place each wrapped apple in a greased cake pan. In a bowl melt the butter and add sugar and vanilla. Pour the sugar mixture over top of apples. Pour the soda around the apples and sprinkle with cinnamon. Bake at 350 degrees for 30-40 minutes. 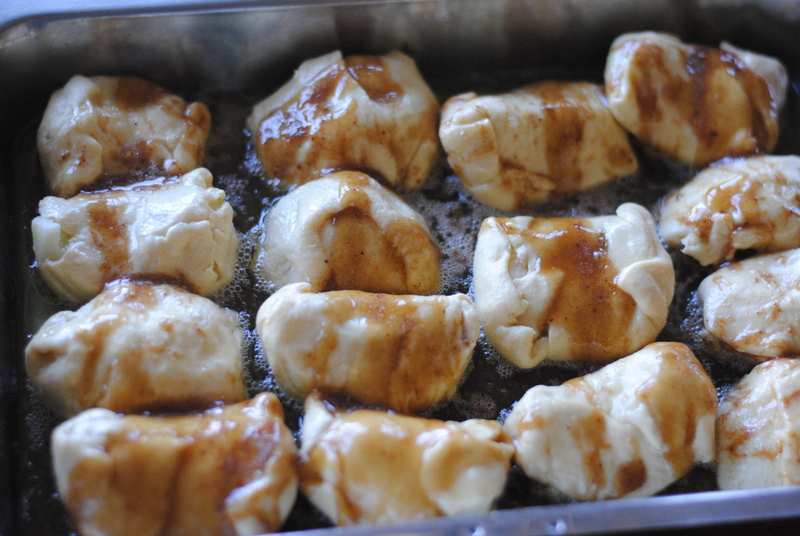 They are done when the mixture is bubbling and the rolls are nicely browned. Serve warm with vanilla ice cream.